Previous image: Access to the Louvre Museum. In this section we present the main point that leads the team of Russian mathematicians to understand the logic of the manipulation of History. It consists of the description of the process leading to the publication of the first Almagest, which was officially made public in the 16th century. 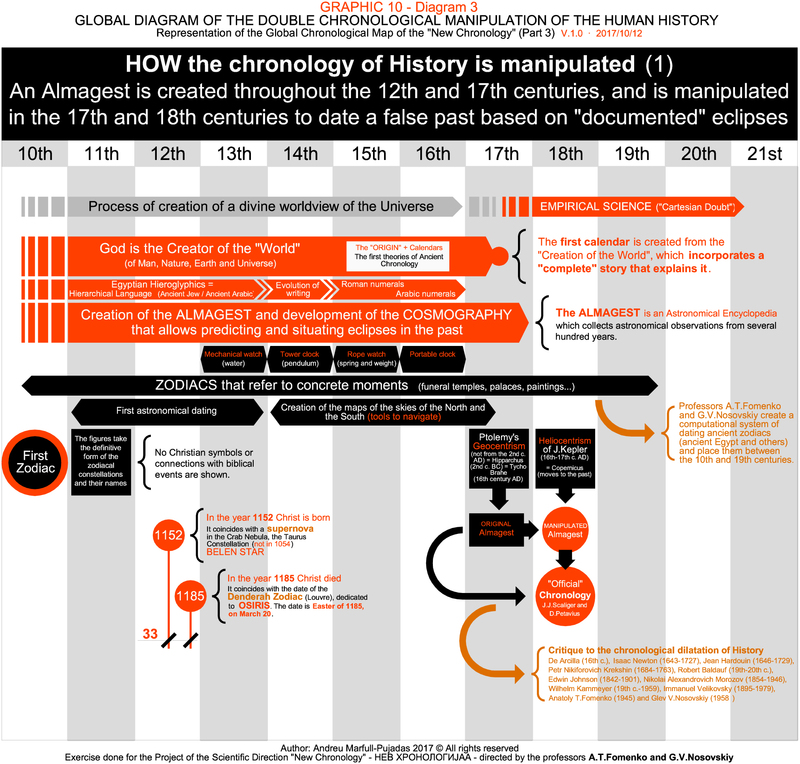 As the New Chronology discovers, the first published Almagest would have already incorporated chronological dilation, that is, it would not be the original. It would have been located in the times of Ancient Greece, although the astronomical dates would have begun, really, in the 13th century AD, not before. In this exercise, however, it is indicated that the manipulation is not made in the 16th century, it was in the 18th, to the extent that the Empire does not implode until the 17th century. Everything is part of the same process. In the 17th and 18th centuries, the books published in the 15th and 16th centuries were written. An Almagest is an encyclopedia of astronomical dating. Officially, this practice is situated in the times of the pre-Christian Greek Empire. Specifically, it refers to the work of Hipparchus of Nicaea (2nd century BC), although it is Ptolemy of Alexandria (2nd century AD) who transcribes it. It is considered that, thanks to Ptolemy, the Almagest is preserved until the Middle Ages and, according to the NC, it is not until 1528 that the first printed edition is published. The 1528 edition (by Jorge de Trebisonda) incorporates the chronicle of its 17 centuries of antiquity. But this documentation would have been a manipulation. Until the 16th and 17th centuries AD. the Universe is not understood. Geocentrism and heliocentrism appear then (Copernicus, Galileo, Tycho Brahe, J. Kepler…). To arrive at this conception it would be necessary, before, to develop instruments for the control of time. In the beginning, rudimentary bells appear (13th century AD), and it was not until the 16th century AD. that the portable watches appear. Thanks to these mechanisms, the rotation of the stars can be accurately calculated. This information allows, on the one hand, for understand the laws of the Cosmos, and on the other, to guide navigation through the great oceans. Thanks to this, a cartography school and the celestial maps of the North and the South, necessary to navigate, would be created. This process would begin in the 14th century AD, and would reach its culmination in the 16th century, not before. Previously, there would have been the development of writing, which would begin with the Egyptian hieroglyphs (11th century AD approximately) and would be normalized with the appearance of Roman and Arabic numbers (15th and 16th centuries AD). And, initially, the first figurative representations of Heaven would be created. This original moment represents, for the NC, the beginning of the development of documentary techniques, which allow establishing schools, models, which evolve and progress together with technology, knowledge in general, commerce, specialization of arts and crafts, and the complexity of human societies. In its origin it would seek to decipher a global knowledge, and create a symbolic language, where nature and the cosmos, “creation” and the laws of the Universe, would merge to create the conception of a “God”, a being “perfect”. For this reason, the figurative symbols of the zodiac predate the Christian icons, and these are, in origin, an evolution of the former. Therefore, the figurative language, the symbols, the writing, the control of time and the understanding of the World are developed between the 10th and 16th centuries AD. This reflection is fundamental to understand the scientific basis of the NC. In this historical instant science appears, and the ability to predict eclipses. When this happens, the historical time is manipulated, old eclipses are calculated and a legendary past full of astronomical references is written, in order to give consistency to these stories. The reason? To create a legendary image of Christ, which would originally be earthly, and disassociate it from the powers of the great Khans, or emperors, who until then would have been “the word of God” on Earth. As the “Christian” Empire prevails, multiple territorial domains are created, and the “word of God” becomes a universal symbol. Also, another of the scientific bases of the NC is represented in this graph. The professors A.T.Fomenko, G.V.Nosovskiy and Tatiana N.Fomenko create a computer system of dating the ancient zodiacs (from ancient Egypt and other places) and the result is clear. The oldest zodiacs are from the 10th century AD, and the most recent from the 19th century AD. That is, until after Napoleon funeral temples were created in Egypt, despite the fact that the Official History places them thousands of years before. The scientific evidence is clear: it is a manipulation that explains the archaeological plunder that, from Europe, is practiced in Egypt from the 19th century onwards. As a complementary test, the list of authors that question the chronological dating of Ancient History is presented. This debate begins in the 16th century, officially, but it is not until the 18th century that it is truly documented. The main authors of reference are: De Arcilla (16th c.), Isaac Newton (1643-1727), Jean Hardouin (1646-1729), Petr Nikiforovich Krekshin (1684-1763), Robert Baldauf (19th-20th c.), Edwin Johnson (1842-1901), Nikolai Alexandrovich Morozov (1854-1946), Wilhelm Kammeyer (19th c.-1959), Immanuel Velikovsky (1895-1979), Anatoly T.Fomenko (1945) and Glev V.Nosovskiy (1958). This graph focuses attention on the historical parallelism between two events, which theoretically do not have a direct relationship. This is the temporal continuity between the end of the Roman Empire (17th and 18th centuries AD) and the plundering of Ancient Egypt (19th and 20th centuries AD). The official history separates them in time, but the NC transforms it into contiguous facts. In the 17th century the Empire implodes; which is guarded by Egypt, Constantinople and Trebizond, and new powers occupy it. In the 18th century of the Empire is rebuilt in Europe (Horde) and the Holy Land (Ottomans), in a global war that lasts several decades. The documental pillage (transfer) to the West begins. The Treaty of Vienna (1725) represents a pact between powers, which implies redoing the recent past and recognizing each other. As a result, an alternative past is created and the recent past is transformed into ruins, which are the object of worship (G.B.Piranesi). Napoleon tries to recompose the Empire, but fails. The plunder enters its most intense phase, with an intense archaeological activity and the invention of Ancient Egypt, led by English and French. The plunder is in Egypt, and extends to Mesopotamia and Crimea, expanding to the Earth Globe throughout the 19th and 20th centuries. Along the way, new archives, new libraries and new museums are created, while the Official History is written, as we know it, from the imperial, Christian powers, transferred to Western Europe. The following is a summary of the process of transfer, purchase and dispossession of the libraries of the Holy Land to Europe through documented sources. This episode is documented as a process that takes place throughout the 15th and 16th centuries, but until the 18th century the great museums, archives and libraries where they are exhibited are not promoted. The chronological distance, following the thread of this exercise, is reduced by 185 years, and brings these two episodes together in time, making them contemporary. That is, throughout the 17th and 18th centuries an intense (and extensive) documentary transfer from East to West takes place, and that is when the integral manipulation, on a large scale, of Human History begins. Then the History Academies appear. But Europe, had already started the creation of schools oriented to the cultivation and dissemination of knowledge. These schools would be the root of the “universities” that would promote the Academies of Science and History in the 18th century, in a generalized manner. The “peace” of the Ark of the Alliance, of 1486, allows the impulse of the institutionalization of the academic establishment. The “wisdom”, therefore, became the object of universal worship from the 16th century, not before. 1458-1673 = 1088-1303 Studium Generale. General Studies in Western Europe, the root of the “Universities”. 16th c. (9th c.) Salernitana Medical School. “Salerno” refers to “Shalom”, the Hebrew word”Peace” that is at the root of Jerusalem and of Solomon (peace and wisdom are equivalent). 1458 (1088) General Study of Bologna. 1520 (1150) Universitas magistrorum et scholrium Parisiensis, in Paris. 1537 (1167) Colleges in Oxford. 1545 (1175) Studium mutinensis, in Modena. University from 1682. 1579 (1209) Colleges in Cambridge. 1588 (1218) Universitas Studii Salmanticensis, in Salamanca. Salamanca was called Shalamanqa, which means “City of Solomon (or Suleiman)“. Soliman’s wisdom is linked to the General Survey and to the name of the city. In 712 (1452) Musa (Moses) Ibn Nusair occupies Salamanca. 1590 (1220) Universitas medicorum (of medicine) in Montpellier. 1670 (1300) Estudi General of Lleida. 1673 (1303) La Sapienza of Roma (Studium urbis). 1735 (1365) Alma Mater Rudolphina, in Vienna. The “Universities” become popular with the appearance of the mendicant model, which allows its financing and the appearance of the Gothic cathedrals. Gold comes, too, from America. Originally from Crete (Candia, from the house Laskaris, which later connects with the Dukes of Gandia, the Borja) and from Trebizond (imperial headquarters of the family of Andronikos Komnenos, Christ). 1613 (1428) He arrives in Italy. It is placed under the protection of the King of Aragon. He is appointed secretary of the Bishop of Rome. At the service of Cardinal Bessarion. 1644 (1459) He compiles the Almagest of Ptolemy (officially). 1713 (1528) The first published version of the Almagest of Jorge de Trebizond (according to the New Chronology by Fomenko and Nosovskiy). The year 1722 (1537) is published the Latin version and the year 1723 (1538) the Greek. All these versions are manipulated, and serve to rewrite the past. George of Trebizond is also credited with the translation of the work of Eusebius of Caesarea, as well as works of Aristotle and Plato. Originally from Trebizond (imperial headquarter of the family of Andronikos Komnenos, Christ). He is Archbishop of Nicaea (land of the Laskaris Komnenos, root of the Habsburgs), Patriarch of Constantinople and Bishop Administrator of the Diocese of Pamplona. 1608 (1423) He enters in the Order (Imperial) of Basil the Great, of Trebizond. 1643-1648 (1458-1462) Bishop Administrator of the Diocese of Pamplona. 1653 (1468) He delivers a “Great Library” to the Republic of Venice, officially with about 800 Byzantine and Greek codices. Bessarion contacts with the Venetian powers, which are then intercepted by the Hellenic powers competing for northern Italy (officially are France and the Habsburgs, unofficially are the Angelus and the Laskaris). The Library is later intervened by the Dukes of Florence, the Medici, before being sent to Paris. In the stay in Navarre it coincides with the powers of the Kings of Aragon and the Counts of Ribagorza (Laskaris). Descendant of Andronikos Komnenos (Christ). Philologist Hellenistic protected of Cardinal Bessarion. He’s responsible of the Library of the Medici in Florence. He extracts codex and manuscripts from Constantinople and the monasteries of Athos. 1677 (1492) Moved to Paris, when Lorenzo Medici died. 1679 (1494) Intermediary between Andreas Palaiologos and the King of France, in order that the first one surrender the rights of the Empire in exchange for recovering Constantinople and Morea (Greece). 1688-1694 (1503-1509) Ambassador of the King of France in Venice, where he comes into contact with the Library deposited by Cardinal Bessarion. Between 1677 and 1719 (1492-1534) he travels between Paris and Rome, and participates in the compilation of the Libraries of the Holy Land, which are then subject to manipulation and are used to rewrite History. The lineage of the Medici, Dukes of Florence and after Tuscany dissolves in 1737, and is used to write the Chronicle of the occupation of the throne of France in the (false) 16th and 17th centuries, and also of some Popes. Hernando Colón, the son of the “discoverer” Christopher Columbus, has a humanistic library with 15,000 volumes, which correspond to part of the heritage of the Januese (Genoese) Order. 1714-1721 (1529-1536) Columbian litigation (last stage). The rights of the Columbus are eliminated, coinciding with the negotiations after the War of Spanish Succession. 1724 (1539) The Library shifts to the Cartuja of Seville, by will of Columbus. 1729 (1544) The Library shifts to the monastery of Saint Paul, Seville, run by the Toledo family (Dukes of Alba), where it is looted. Cathedral of Seville, and is renamed Biblioteca Colombina. The Colon was a Byzantine imperial family, under the command of the Januese Order. Hernando Colón compiles a large library, from the transfer of funds from the Holy Land to Western Europe. Between 1724 and 1737 (1539-1552) the Library was intervened, at the service of the complete reconstruction of History. The University of Alcalá de Henares, of the Archdiocese of Toledo, is founded. When the colonial reconquest begins in the name of the powers transferred in Hispania, the University of Alcalá is promoted. It is the first step to establish the new capital, in Madrid, and to rewrite the History of Spain. 1746 (1561) Moving the Court from Toledo to Madrid. 1748-1769 (1563-1584) El Escorial. New residence of the Spanish Royal House, Bourbon (not Habsburg). The Toledo (Alba) intervene the Biblioteca Colombina (Columbine Library) in 1729 (1544), after having created the School of Translators of Toledo. In 1053 Peter Komnenos, brother of the Roman emperor Isaac Komnenos, was born (officially). Peter Komnenos is the first Alba of Hispania, who takes the surname Toledo for having conquered the city of Toledo in ≈ 1455 (1085). 1053 is essential in the New Chronology by Fomenko and Nosovskiy. Corresponds to the chronological jump between the Holy Roman Empire of the German Nation and the Roman Empire in time of Christ. The years 0-33 of Christ correspond to years 1053-1085 of Pope Gregory Hildebrand, which would be his reflection. In addition, the Emperor Isaac Komnenos is also a reflection of Christ. Therefore, the Alba would have been compared to Christ in two ways, the result of the manipulation (creation) of the past. Toledo becomes the main peninsular center for translation of Greek-Latin texts from Alexandria, from Arabic or Hebrew, to translate them into Castilian. According to professor Julio César Santoyo, the name of School of Translators of Toledo is used for the first time at the beginning of the 19th century (Jourdain, Renan) and in Spain in 1881 (Menéndez Pelayo). His legend is created in the 19th century. Austrian Ambassador to the Ottoman Court (officially with Suleiman the Magnificent) to negotiate the armistice with the Ottomans. 1739-1747 (1554-1562) As a diplomat in Constantinople he obtains an important collection of Greek texts, which are sent to the Library of the Court of Vienna. Officially hundreds are spoken. 1767 (1582) The same year that the Gregorian calendar was officialized, Ogier was appointed ambassador to the French court. Throughout the 18th century (not the 16th), the Hellenic libraries are looted and moved to the orbits of Paris and Vienna. The idea of ​​the Society is conceived in Barcelona, ​​in the orbit of the Januese nobility (Ferrer and Colom), from the year 1708 (1523), when Rhodes falls. In 1720 (1535) it was founded in Paris, and in 1725 (1540) it was approved by the Pope, a Farnese (brother of Pope Borja’s lover, Julia Farnese). The Society of Jesus is created to spread the “papal” project: the transfer of Prester John (Great Khan) to Rome, and to create schools of History around the world, in which the new calendar is imposed. Hierarchical organization is reinforced in the Catholic Church. The Sacraments of the Catholic tradition are defined. It is proclaimed that the Pope is the “Universal Pastor of the whole Church”. 1730 (1545). Pope Paul III (Farnese, from the orbit of the Borja) convokes the Council. 1768 = 1583 De emendatione temporum, of J.J.Scaliger. First compendium that chronologically orders the Bible with ancient civilizations. It is used until the 21st century. The last edited edition of the Bible is published. It is presented as a source of divine revelation. Its character is given to Tradition and its free interpretation is denied. Throughout the 18th century a global alliance, forced by circumstances, takes place that allows us to impose a historical account at the pleasure of all. The pact would have been to legitimize all the empires and to recognize the Pope of Rome, endowing them all with a legendary past that authorizes the acquired powers. From the original Christ, the mythical origin of the lineage, the myth of Jesus is preserved. This episode allows rewrite History from the European Christian orbit, but quickly fails as a spiritual project. The publication of the Bible in 1777 (1592) represents a challenge in the Kingdom of France, which remains in the Protestant orbit. For this reason the French King (Huguenot) was forced to accept Catholicism in 1778 (1593), and the French people (Masonry) rebels in 1789 with the French Revolution, confiscating the goods of the clergy and ending the monarchy. There are some letters proving that Meleitos gives books from the Patriarchal Library of Alexandria to the Queen of Navarre (Medici), who is also Queen of France. A letter informs that it is prepared to gather “Arab, Ethiopian and Coptic manuscripts of interest to J.J.Scaliger”. Meleitos would have been the Patriarch of Alexandria in the time of Napoleon, who would have gone to Egypt to take the History of the Original Empire. The library is created with the looting of the libraries of the Crown of Aragon. 1738 Foundation of the Real Academia de la Historia (Madrid). Their library is created. The Royal Library shifts to the Mazarin Palace. It has its origin in the Library of the King, created officially in 1553 (1368). 1720 The Department of Manuscripts (Eastern and Western) is created, where is the collection Cabinet of Familiar Genealogy (the genealogical falsification of the Kings of France). 1822 The Dendera zodiac, dedicated to Osiris, arrives in France and is deposited in the National Library. 1922 The Egyptian background of the National Library is sent to the Louvre Museum, including the Dendera zodiac. The zodiac of Denderah transcribes the date of the Easter on the year 1185, reflecting the date of the death of Osiris (Christ) according to the work of the “New Chronology”. Plunder of the Januese Library from Columbus. The plunder is extended throughout the 18th, 19th and 20th centuries. First Official Archive of the Crown of Castile. 1844 First partial opening of the archive to the public. It has its origin in the Library of the Imperial Court, created officially in 1553 (1368), as in France. 1899 The “Papir and Papirusmuseum Viennese” Collection is created. Collect 18,000 objects from 3,000 years of Egyptian history, officially 1500 BC. to 1500 AD. It has its origin in the Royal Archive of Barcelona, ​​officially created in the year 1503 (1318). 1503 (1318) The Royal Archive of Barcelona is created, by James II the Just. 1558-1678 (1188-1308) The Royal Archive is in the monastery of Santa Maria de Sixena, of the St. John nuns. The rest of the Archive is in the monastery of the Order of St. John and in the palace of the Order of the Temple of Solomon, in Barcelona. 1726 It is decided to “close” the contributions to the Archive. Between 1713 and 1725 the Bourbons and the Habsburgs negotiate their powers in Europe, and then the Royal Archives is rethought. Unlike the archives of the emerging empires, the archive of the Catalans is intervened, officially to classify the documents and modernize the management. But it is manipulated in its entirety. As in Venice, Genoa and Florence, it is an original imperial archive, intervening for “state” reasons. 1734-1743 (1549-1558) The Palace of the Viceroy is built next to the Royal Palace, and there is placed the Holy Inquisition and the Royal Audience, which administer the Archive. 1738 New plant of the Archive, which acquires the name of General Archive of the Crown of Aragon. In the same year, the Royal Academy of History is founded. Probable beginning of the invention of the history of the Crown of Aragon, as it is known in the 21st. c.
1772 The Archive goes to the Palace of the Audience, in the former side of the Generalitat de Catalunya. 1838 The Archive moves to the Palace of the Viceroy, where until then is the Inquisition (abolished in 1834). 1838 The book “Los condes de Barcelona vindicados, y cronología y genealogía de los reyes de España considerados como soberanos independientes de su marca” [“The counts of Barcelona vindicated, and chronology and genealogy of the kings of Spain considered as sovereigns independent of their brand“] is published by Prospero Bofarull y Mascaró, archivist of the Archive of the Crown of Aragon. Probably, part of the history of the kings of Spain is written in Barcelona, ​​based on the imperial documents that are manipulated. The National Library of the United Kingdom. At the moment the most extensive bibliographical fund of the World is considered. 1757 Collection of the “Royal Manuscripts“. King George II delivers the royal manuscripts, which date back to the 15th century (Edward IV). 1823 Collection “Manuscripts of the King“. King George III delivers historical manuscripts to the British Library. It opens to the public for the first time in 1759. 1753 First collection of Egyptian objects. Donation of Sir Hans Sloane. 1801-1803 Confiscation of Egyptian antiquities (such as the “Rosetta Stone“) from Napoleon, which are then transferred to the British Museum. 1825 First significant collection of the Middle East (Mesopotamia), provided by Sir Claudius James Rich. 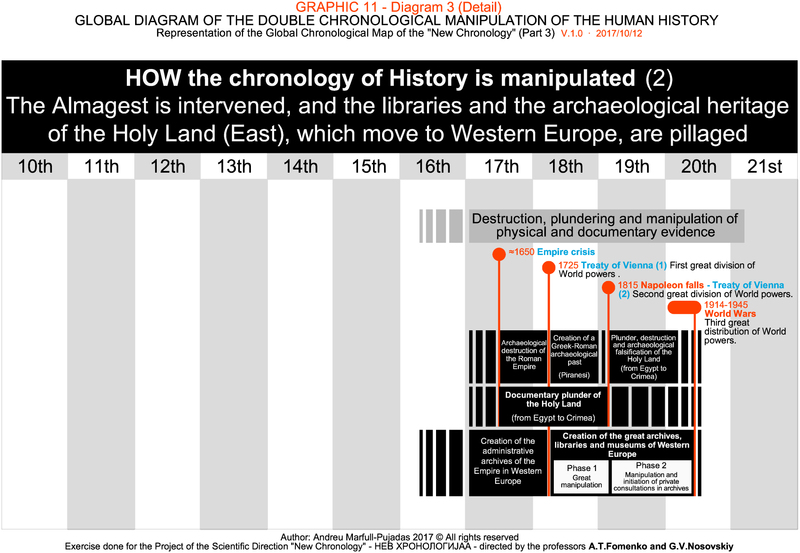 19th and 20 c. = Systematic plunder of the Egyptian, Greco-Roman, Middle Eastern, Asia, America and Oceania archaeological heritage. The archaeological plunder, including its systematic destruction and falsification, appears in the 19th century, after the Franco-British occupation of the dominions of the Holy Land (Egypt and Palestine). Archive created to centralize documentation concerning the Administration of the Spanish overseas territories. 1783 (1598) The Casa Lonja de Mercaderes is created, the headquarters of the Archive. Castilian colonization of America takes place in the 18th century. It is Castilian in the name of the Anjou (Angelus), who occupies the Throne of the Spaniards in the place of the Habsburg (Laskaris), with imperial aspirations. Inicialmente Muséum central des arts de la République. It’s created by acquisitions (purchases and plunders) of the French monarchs. 1750-1779 First public exhibition of the patrimony of the King of France. It exhibits a collection of paintings of the Renaissance and Flemish art in the Luxembourg Palace (Paris). 1789 Nationalization of the assets of the monarchy and the clergy (French Revolution). 1793 First exhibition of the King’s collections in the Louvre. 1816 With the capitulation of Napoleon it assumes the name of Royal Museum of the Louvre. 1826 Creation of the Department of Egyptian Antiquities. Over the years three sections were created: Pharaonic Egypt, the Roman and the Coptic, along the line of the falsification of the Egyptian history established in the 19th c.
In 1795 (1610) the Secret Archive was created. It has its official origin in the Vatican Library, founded in 1633 (1448). The Vatican Library has, from its origin, a significant background of the Imperial Library of Constaninople, officially destroyed by the Turks in 1638 (1453). 1783 Official transfer of the archives of Avignon to the Vatican. 1798 Napoleon occupies Rome and the Vatican. 1798 Official transfer of the archives of the Castello Sant’Angelo (fortress of the Vatican officially originating of the Roman Empire) to the Secret Archive. 1810 With Rome and the North of Italy occupied by Napoleon, the Archive is transferred to Paris. 1815-1817 When Napoleon falls, the Secret Archive returns to the Vatican. 1881 First permits for the occasional visits of the scholars who are not clergy. Initially it is called Imperial Public Library and during the years 1925-1991 Lenin Library. 1773-1774 Denis Diderot and Voltaire sell their library to Empress Catherine the Great. 1814 The Imperial Library is launched. 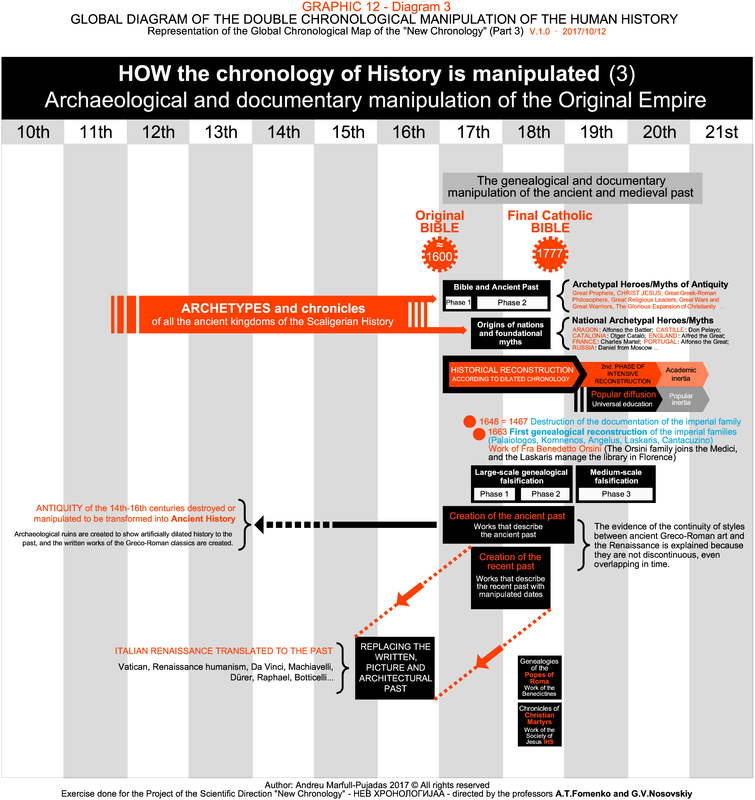 As indicated in the graph, History is reconstructed between the 17th and 18th centuries, which is dilated, and the chronicles and archetypes of the sacred text that explains the implantation of a World Empire are used. The origins of nations are created, and new heroes. But it also creates an old and a recent past. The maximum evidence is the continuity of styles between the Greco-Roman past and the Renaissance, which adopts Christian icons, in an instant that the NC situates in the 16th century. But all is manipulated. The modern Renaissance, as documented by the CN, is created in the 17th and 18th centuries, and is moved to the past. For this reason, two differentiated phases in historical reconstruction are identified. In the first place a past is created that fills the thousand added years, and secondly a complementary reconstruction is made that incorporates, in the case of Europe, 185 added years. In the case of Spain, the Jesuit Jerónimo Román de la Higuera does this work, and invents the history of Christian Rome in the peninsula. Dozens of characters are invented, but throughout the 18th century it is questioned. Why? because the Church changes its role; the Pope of Rome fails as new Great Khan or Prester John. In turn, the myth or legend of Christian martyrdom is invented, and the work of Román de la Higuera is contradicted, since it does not contemplate this martyrdom. Thus, in the 19th century (not before), it is concluded that he is an impostor, and that his work is the biggest fraud in the History of Spain. That is, it is an evidence of the process of historical reconstruction that the NC has documented extensively, with the peculiarity that in the 18th and 19th centuries is unauthorized. But everything has its meaning, nothing is free. As the NC deciphers, the Society of Jesus creates the Christian “saints” in the 18th century, and the Benedictine Order creates the genealogy of the Popes of Rome.